By 1969, United had been playing in various styles of White & Black for 46 years, with the current all white strip with black trim having been used for 6 seasons. With many other clubs also playing in these colours, United were continually having to play in their change strip of black shirts and shorts. The directors of the club felt it was time for a change, and wanted a more modern look. Having been invited to play as Dallas Tornado n the USA in the summer of 1967, United were invited back for a similar competition in the close season of 1969. The Tornado colours of burnt orange with a columbia blue trim was a vibrant and modern looking kit (remember, this was the late sixties! ), and Mrs. Kerr, the wife of United manager Jerry Kerr, made the suggestion of a change to a similar bright design. However, with Dundee FC having played in blue for most of their history, United decided to change to a black trim. 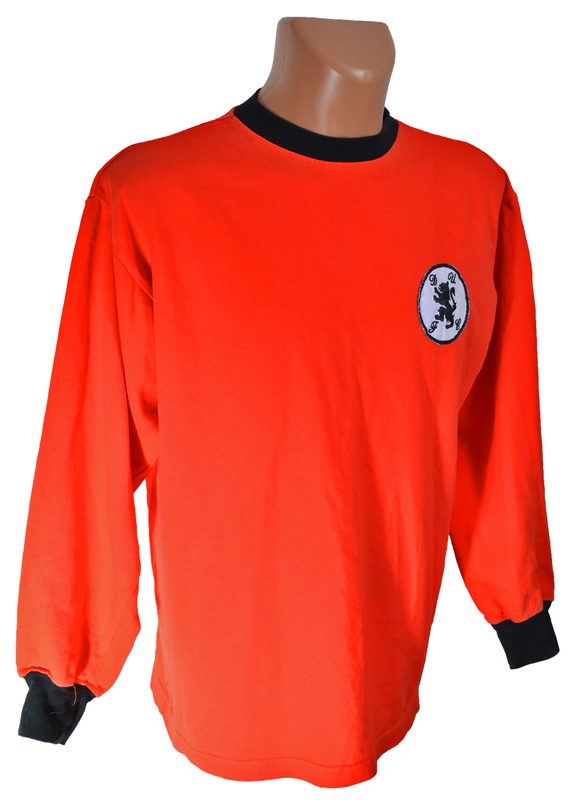 The cotton made tangerine shirt was accompanied by a round black collar and black cuffs, and a new circular white badge was designed to replace the old fashioned DUFC shield. The lion rampant was borrowed from the club shield that had appeared on programmes and merchandise since the mid-1950s, but had yet to appear on the shirts, although this new lion had a more snazzy look to it. The tangerine shorts had black trim down either side, and the tangerine socks had a black trim at the turn-overs. The new all tangerine kit was worn for the first ever time in a pre-season friendly with Everton at Goodison Park, where Ian Scott gave United the lead before Everton went on to win 4-1. Competitively, the first match in the new kit was a League Cup Sectional tie against Hearts at Tannadice. The kit was used for three seasons, with its last appearance being a 1-0 victory over Dunfermline at East End Park.